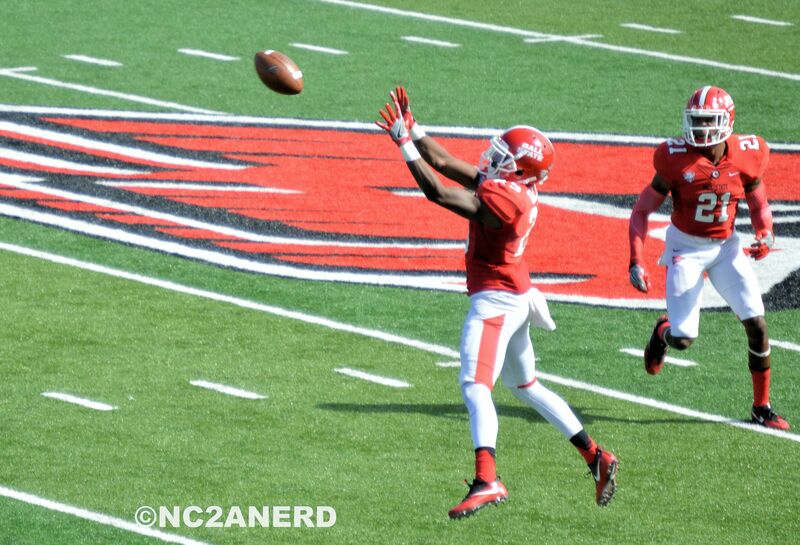 Ball State defenders loved the ample chances for interceptions in this game. Had the pleasure of meeting up with a few college friends this week to see my alma mater take on FCS Eastern Kentucky, my mom’s alma mater. So this game had family rivalry. 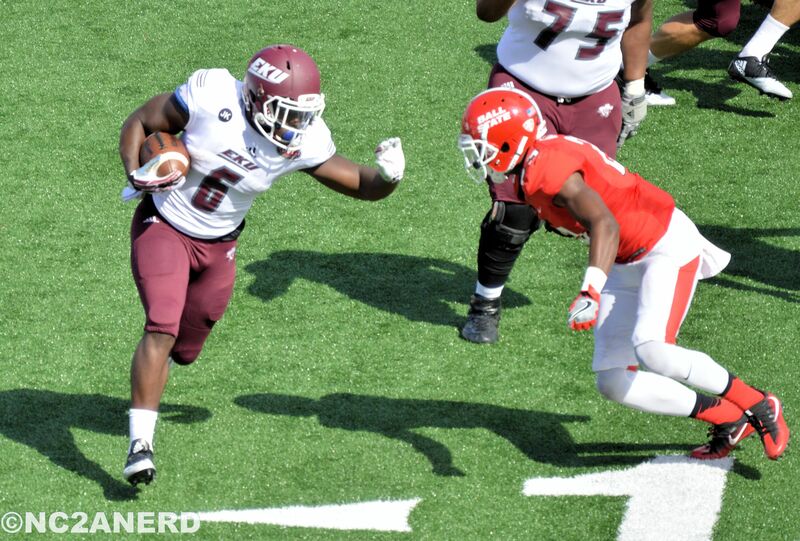 Both teams entered 1-1 and many thought the Colonels of EKU could make a game out of it. Shockingly, Eastern’s offense played worse at Ball State than it did at Purdue two weeks prior. Starting QB Bennie Coney was pulled with a 1 for 4 stat line of one yard and two interceptions. Something fans in the stands could have duplicated. Maty Mauk, a transfer from Missouri, played better but was far from good. His best stats came in the fourth quarter in garbage time. Eastern Kentucky committed 128 yards in penalties including a running into the punter that extended a Ball State drive that led to a touchdown. The Colonels practically blew themselves out. Ball State won easily but the contest was more about how inept Eastern Kentucky was. The Cards were able to spread the ball around to three different receivers that had six receptions each. The defense does deserve credit for holding EKU to just three yards rushing. It helps though when you know a team can’t pass. The best part of the day was Eastern Kentucky trying to fire themselves up on the sideline with a huddle after the third quarter. Problem is they were down 34-0. Cardinals would win 41-14. 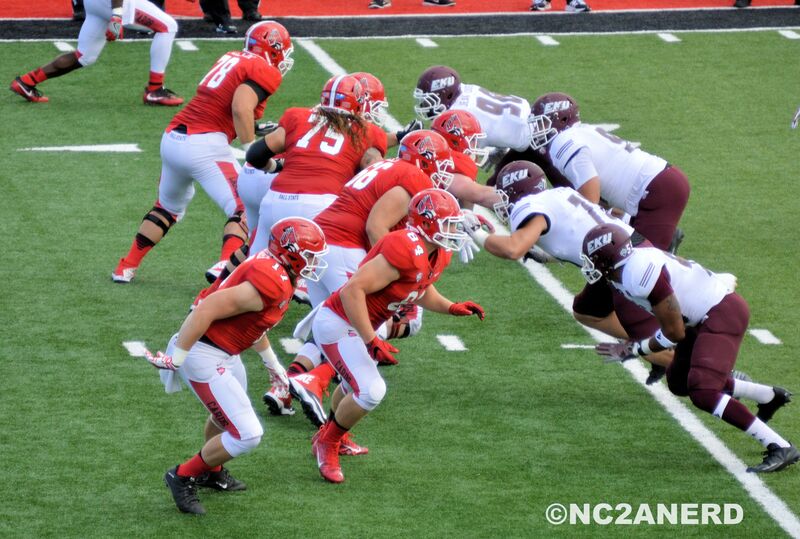 Ball State did a great job of protecting QB Riley Neal. 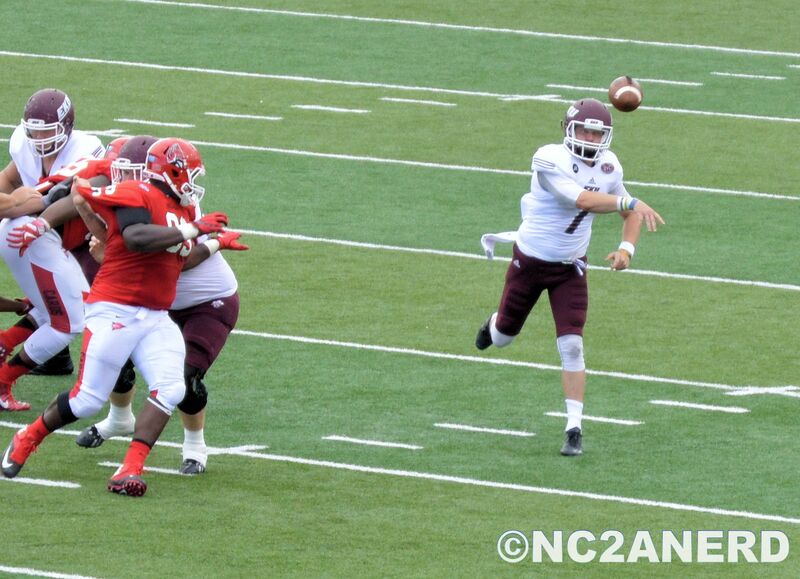 EKU couldn’t run the ball at all. Punting from their own 10 yard line occurred more than once. 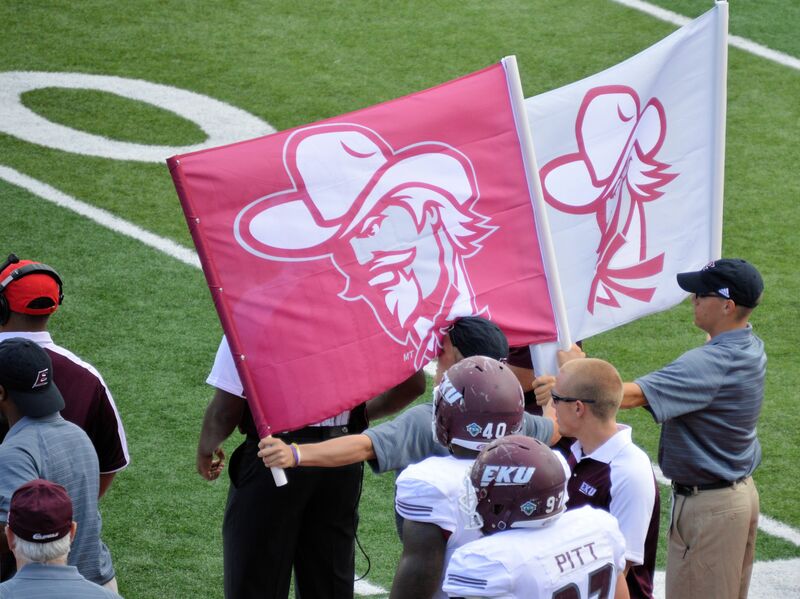 EKU covered signals with these flags I think to prevent people from stealing them in the press box. College football is back with games starting tonight with 16 games. Here is a breakdown of the action. 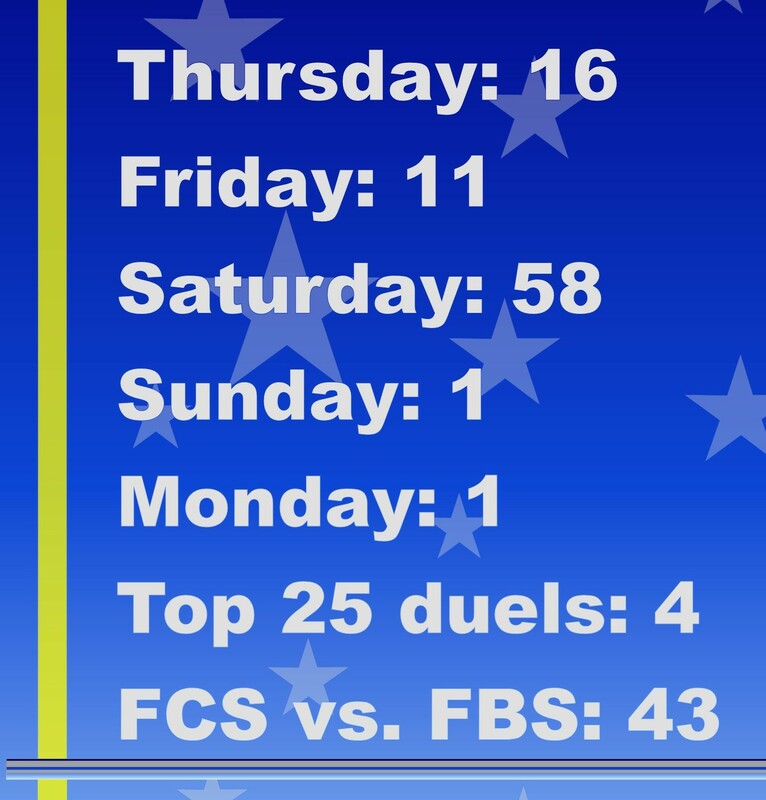 While the top 25 showdowns are there, the number of potential FCS upsets over FBS schools is what I am looking for. Look for three to five FBS schools to embarrass themselves. A look a North Carolina’s schedule. Scheduling is not easy for college athletic directors, but Power 5 conferences have privileges the mid-majors and FCS schools do not. Money, attendance and prestige for starters, as the big schools can get anyone to play them and pick where they play. So when I see a Power 5 school go light with their non-conference schedule I get annoyed. Sure, everyone is entitled to play a FCS school and a Sun Belt doormat, but when that’s all your team does outside of conference action it’s time to g rab your pitchfork and charge the athletic office. Here is a look at some schools that could have done a little more in non-conference. Washington State has a relatively small stadium for a Power 5 school and that’s a good thing with the weak home slate the Cougars have. It at least gives them hope of selling out when Portland State and Wyoming comes to town. They do travel to a Big Ten team in Rutgers but the PAC-12 schedule is one of the weakest in the conference with USC and Utah left off. Only Stanford and Arizona State will come into Pullman as teams that played in a bowl last year. 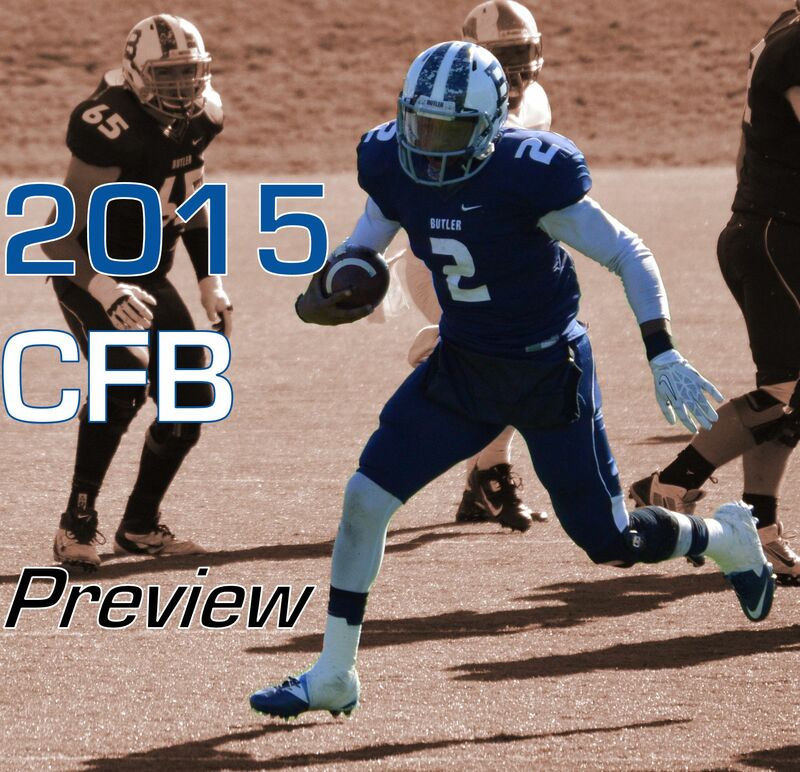 By the time they do arrive the Cougars may be 2-5 so buy those season tickets today. Give credit to Arkansas for playing Texas Tech but it only has four true road games on the schedule. With seven home games and a neutral site contest with Texas A&M, Arkansas is determined to make Head Coach Bret Bielema look as good as possible in his third year. Poor UTEP, Toledo, and UT-Martin. Just let those cupcakes bake at 350 degrees and let them cool for five minutes. The Gators are just as guilty as the Razorbacks with only four road games. Florida though has to play Florida State as a rivalry so that doesn’t mean much in terms of scheduling credit. Especially in a year where Auburn and Alabama are not on the schedule making SEC play somewhat manageable. 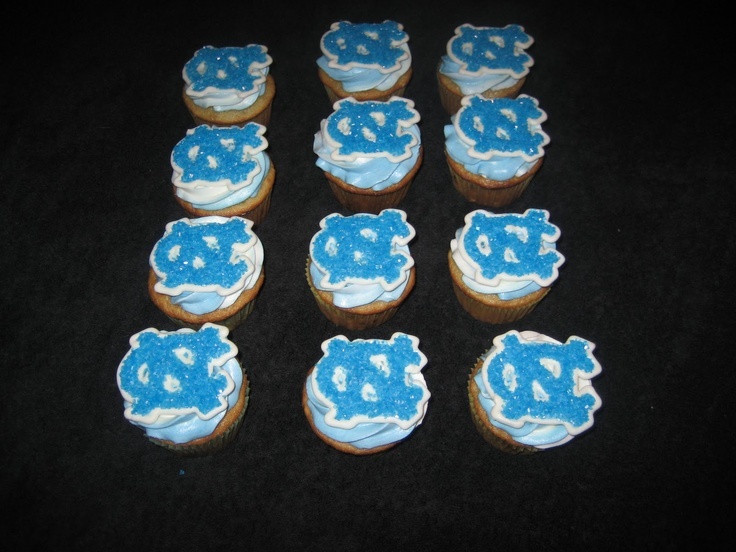 East Carolina is a tough Group of Five school but New Mexico State and Florida Atlantic are pure cupcakes. Penn State does have stomach to play at Temple but that doesn’t mean much when you have won the last 31 meetings. Home games against Buffalo, San Diego State and Army West Point are added to a suspect Big Ten slate. The Nittany Lions dodge all the good teams of the West Division. Instead of dealing with Iowa and Wisconsin it’s Northwestern and Illinois. Maryland was supposed to be a road game but that it is a neutral site contest in Baltimore. The result is only three true road games in conference to go along with a four mid-majors. If Penn State is not 6-0 going into Ohio State on Oct. 17 than it should be considered a failure. FSU has to outdo in-state rival Florida so it welcomes two FCS programs to Tallahassee in 2015. Again, you can’t give credit to the Seminoles for playing at the rival Gators. That game is an obligation. When you add South Florida, Texas State, and Chattanooga to an unappealing ACC menu it does not attract interest. At Clemson and at Georgia Tech are games of interest but the Noles will face the challenge of not looking ahead to those games. Miami and Louisville are at home minimizing the upset potential. Boston College opens with two FCS schools in Maine and Howard. The Eagles are another school with only four road games. Yeah, it’s cool Boston College plays Notre Dame and a tough MAC school in Northern Illinois but the road schedule is Duke, Clemson, Louisville and Syracuse. Not exactly the gauntlet. Part of the problem is that there are not that many FBS programs in the northeast. I would like to see Boston College play Connecticut but maybe they fight over recruits too much. North Carolina doesn’t have the excuse Boston College has as there are plenty of good football programs in the South. UNC also plays two FCS schools and only has four road games. Heck, just two of those games take place before November. I like the Tar Heels playing the Gamecocks of South Carolina on a neutral field but that’s the only thing to like here. Illinois is at home and sandwiched between FCS North Carolina A&T and FCS Delaware. The big kicker though is Florida State and Clemson are not on the ACC schedule. 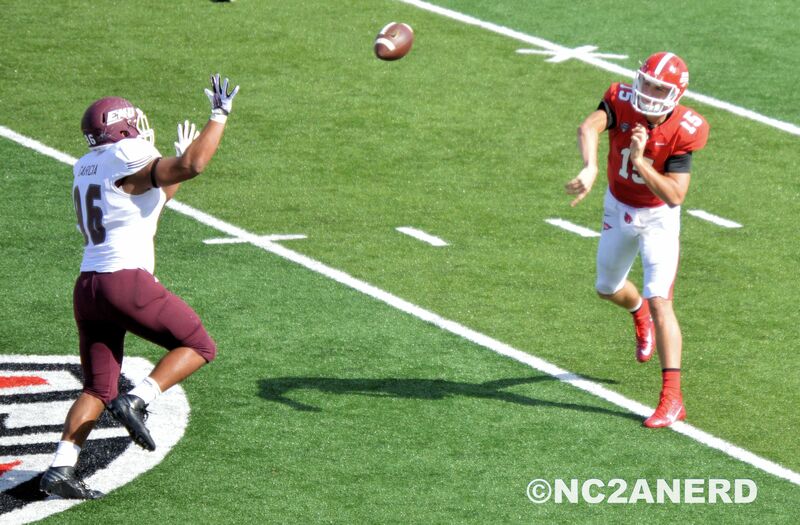 Instead it draws C-listers Wake Forest and North Carolina State out of the Atlantic division. So not exactly must see games will be going down at Chapel Hill this year. You can’t blame UNC for the weaker ACC slate as the conference does that but the Tar Heels should have been more bold in non-conference to make up for it. Two FCS schools when you are in an area filled with CUSA and Sun Belt teams can’t be accepted. I guess this is what happens when you lose to East Carolina two straight seasons. 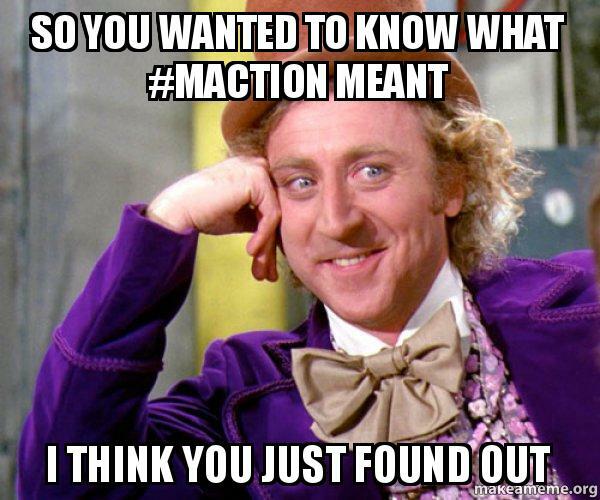 Yep, the MAC just went Willy Wonka on the Sun Belt. College football is down to its final game tonight as the postseason has been underway for weeks. We all know the main headlines such the top SEC teams going down, TCU dominating and Florida State combusting into humiliating defeat in the Rose Bowl. There are facts that are not so prominent like leaving tickets for a celebrity. 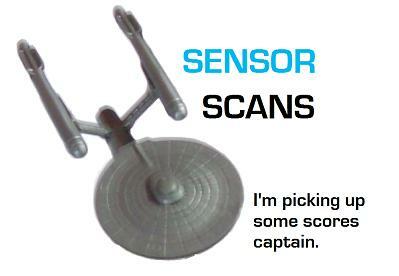 Trust me, it will make sense soon. Here are 13 overlooked stories from the college football bowl season. Oklahoma was pounded by Clemson in the Russell Athletic Bowl 40-6, but found a way to stay up beat on this Clemson touchdown. Clemson gets on the board again, but play is under review. When Oklahoma is clinging to hope of a play being reversed, you know it’s a blowout. It was a great New Years for Georgia Tech with its Orange Bowl win, but a Georgia Tech fan had an even better time as she had this chance meeting with her favorite Yellow Jackets. Arkansas really enjoyed its 31-7 Texas Bowl win over Texas and that deserves bonus points when you beat a team the bowl is named after. The Razorbacks began giving shout outs to fellow athletic teams and signs from fans that trashed their opponent. Seriously, you don’t see any other athletic department people watch like this, but when you’re winning you can do whatever you want. Bowl games always try to have some pep rallies for the fans, and there is also the chance of having the pep rallies turn into a band duel. Like here in the Fiesta Bowl between Arizona and Boise State. I guess the Boise band did better as the Broncos won a close Fiesta Bowl game. It was not a good bowl season to be the favorite. 30 bowls are complete. The Underdog has won outright in 16 of the 30 and Dogs are 19-11 ATS. Dogs 48-90 outright previous 4 bowl years. The Ducks were winners in another area too, promotional advertisements. This ad that aired during the Rose Bowl was among the best commercials for a school during bowl season as it matched the football team to the university seamlessly. It’s always interesting to see how the mid-majors promote their bowl teams. It’s pretty much their season for some of these teams. The Mountain West celebrated its postseason thanks to their record number of bowl teams. Just don’t mention how bad Colorado State, Fresno and Nevada looked. The American Athletic Conference went to the photo route to promote its 5 bowl teams. The AAC went 2-3 in bowls. The best mid-major conference was actually Conference USA who had a 4-1 mark in bowl season. #CUSAFB with 3 bowl wins in 24 hours for first time in league history, with @HerdFB, @WKUFootball & @RiceFootball1 averaging 43.7 points. West Virginia play Texas A&M in the Liberty Bowl in Memphis. You can’t visit Memphis without an Elvis joke and that’s what West Virginia did here. Good thing the King didn’t show as the Mountaineers lost. The Missouri Valley Football Conference had its way in the FCS playoffs, as MVFC schools North Dakota State and Illinois State met in the FCS Championship game. Now that is a conference that should be boasting more than SEC fans. 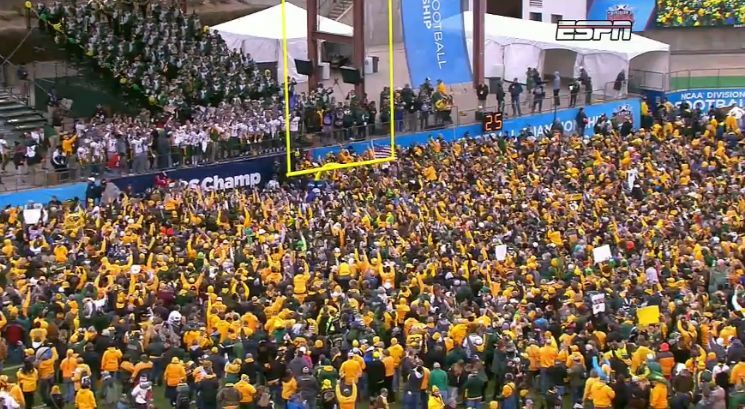 North Dakota State would win a close game 29-27 to earn its 4th straight national championship. Check out the trophy presentation. Where else do the fans gather on the field and the players gather in the stands for the celebration. When you win four straight, a football game turns into a rock concert. The Outback Bowl was all about giving away bloomin’ onions or coconut shrimp based off of the winner of the bowl game. They even went so far to have people dress up as both foods. This Oregon couple had more than just a Rose Bowl victory to celebrate. Houston had a triumphant fourth quarter comeback against Pittsburgh in the Armed Forces Bowl. The Cougars wanted everyone to know they came back from 25 points.
.@SunBelt What’s a #FunBelt anyhow? The MAC and the Sun Belt have all the fun in bowl season. These bowls games are what the conferences are all about in the postseason to the point where it has become a bit of a rivalry. The MAC and the Sun Belt met twice with Bowling Green vs. South Alabama and Toledo vs. Arkansas State. Both games yielded fantastic barbs between the two leagues. Here is an example of what the Sun Belt did when South Alabama scored a touchdown on Bowling Green. Here is the MAC after a Toledo touchdown. In the end the MAC won both games and went into boast mode. 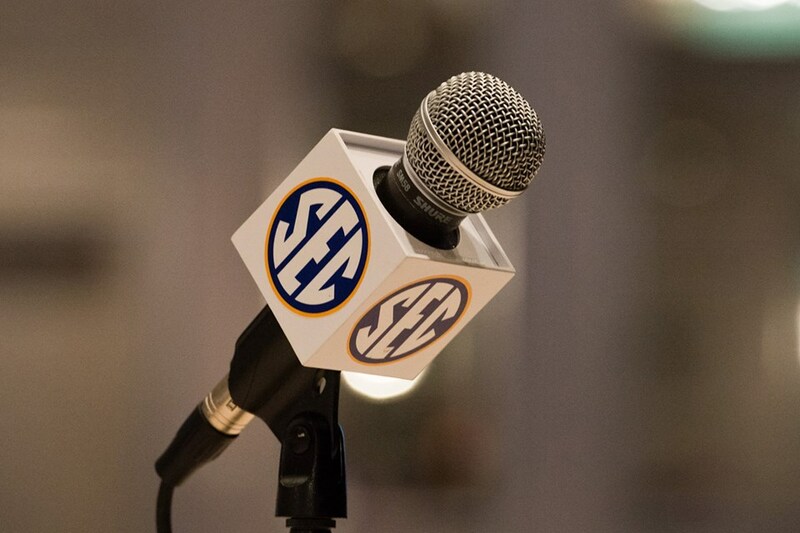 The SEC still has plenty to say for itself. 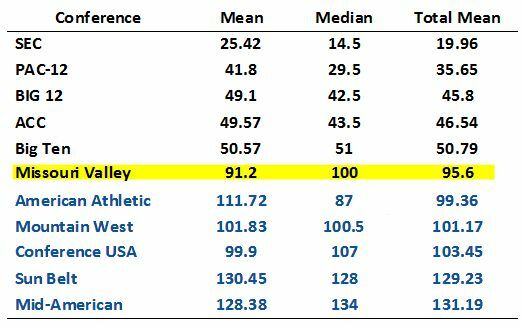 Last year I used the Sagarin ratings to find a quantitative method of determining the best conference of college football. I like the Sagarin ratings because it gives a score and ranking for every team in both FBS and FCS levels. Sagarin splits conference rankings into divisions so I had to do some work to see how the conferences stack up. I found a conference average and median then split the difference to determine a total score. The results are going to make SEC fans very happy. The Southeastern Conference had 13 of its 14 teams in the top 50 leaving Vanderbilt was the weak link as an outlier. Eight teams were in the top 15. That’s right, over half the SEC is ranked in the top 15 of the Sagarin rankings. Alabama’s loss to Ohio State only dropped the Tide to No. 4 but the big surprise was Georgia at No. 5. That is because the Bulldogs went 6-2 against top 30 teams including wins over Clemson and Louisville from the ACC. This doesn’t mean that everyone should view Georgia as a top five team, but it does mean Georgia beat many quality teams this season that should not be overlooked. While SEC critics will point to the elite teams losing on New Year’s Day the conference did go 7-5 in bowls. While the front of the pack teams in Mississippi State and Ole Miss lost, they couldn’t fall far because teams they beat in the regular season (Arkansas, Texas A&M, and Tennessee,) all won. Ole Miss blew out a Boise State squad back in August and that win looks better after Boise won the Fiesta Bowl over Arizona. Arizona’s loss is a blemish on a great bowl season for the PAC-12, who went 6-2 in the postseason. The PAC-12 is the SEC’s biggest competition just like last season as half the conference is among the top 25 teams. The PAC-12’s issue is the bottom half with Washington State, Oregon State and Colorado outside the top 80. Washington State dropped to two games out of conference and Oregon State won but struggled with Hawaii and FCS Portland State. Colorado had a dismal 2-10 season with close calls to UMass and Hawaii as well. This pulled the PAC-12 down just enough to give the SEC the edge. The Big 12, ACC and Big Ten pretty much evened out. 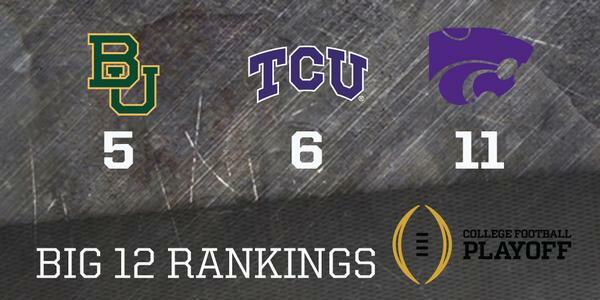 Although it’s important to note TCU is the No. 1 team here. I doubt being the No. 1 Sagarin rating team is going to make up for missing the playoff. All three conferences had too many teams dragging their rankings down. Looking at you Iowa State, Kansas, Syracuse, Wake Forest, Indiana and Purdue. The most surprising find was the Missouri Valley Conference of the FCS being ahead of all five FBS mid-major leagues. Half the Valley made it to the 24-team FCS playoff and the league did well. North Dakota State will meet Illinois State for the title tomorrow in a battle between conference rivals. NDSU defeated Iowa State handily to boost the valley. Northern Iowa was competitive enough with Iowa and Hawaii to make an impact as well. Middle of the pack Indiana State won at Ball State. The result is a FCS league with 70 percent of the teams with winning records. I thought the Mountain West would be a little higher but Boise State was the only team in the top 50 at No. 37. Little things like Air Force struggling to beat Georgia State, Colorado State getting pasted by Utah, and UNLV having a dismal year added up. It’s not good win Fresno State carries the West division despite a loss to the No. 172 team in UNLV. The American Athletic had the largest variety with teams in the top 50 like Memphis and teams outside the top 200 in SMU. Little improvement among the back of the league will go a long way next season. Conference USA may feel cheated to learn that Marshall had the highest ranking among mid-major teams but did not get to play in the Fiesta Bowl. The problem for CUSA is the bottom eight of the 13 teams were outside the Top 100. It’s hard to rate the Sun Belt with two of its top four teams being denied bowl opportunities (Georgia Southern and Appalachian State) but it somehow rated higher than the MAC. Northern Illinois was the highest ranked in the MAC at No. 71 and that’s lowest ranking for any No. 1 team of a conference. The entire MAC East was a disaster with Bowling Green being the best at No. 120. Instead of UMass, or some other team back East, the Mid-American Conference should be looking at the Missouri Valley for expansion. Go west young MAC. Go west. The Sagarin rankings could change a tiny bit after the championship games this weekend but not much as Oregon and Ohio State are both secured in the top 3. For that I have to go with Oregon and North Dakota State in the FCS title. I knew many people in college who hated the idea of having to go through a commencement ceremony and walk on stage for their degree. I wonder if they would have approved of a short commencement on an airplane during a flight to a FCS playoff game? Sounds too specific to makeup doesn’t it? You can thank Sam Houston State for that. Three members of the Bearkat football team walked the aisle for their diploma as the team flew to Villanova for a FCS quarterfinal. The game took place during winter commencement but the school wanted to make sure the three semester grads could walk like every other student. You could see the players walking into the restroom to change into their cap and gown during the video in the back of the plane. The ceremony was a snapshot of Sam Houston State’s surprising run in the playoffs. In the first round, it survived what many viewed as a coin-flip game with Southeastern Louisiana 21-17. On December 6, Sam Houston had the biggest upset of the bracket, taking out 3 seeded Jacksonville State 37-26. The result gave the team a shot at 6 seeded Villanova on Saturday as Sam Houston scored another upset win 34-31 to advance to the semifinals. Take a look at the locker room before the team prayer. Man the FCS playoffs are fun. The most depressing set of rankings in college football this year. Under the BCS, people complained that the college football title was being decided by a number crunching computer. Today in 2014, under a selection committee, is the system better? The committee had to pick four teams, and what we learned on Sunday afternoon is that crunching numbers is still in charge. Just look at the records for the top six teams and you see right away why teams 5 and 6 were left out. See the problem. The Big 12 schools had one less game. The top four schools all played an extra game against a quality team this week. TCU and Baylor were just finishing up their regular schedule. SEC fans and coaches thought the Big 12 had an advantage by not having a championship game. It turned out to be a weakness. It’s not easy to put a team that’s 11-1 over a team that’s 12-1. A computer would not have cared about winning a conference championship. Instead it would have just calculated the strength of schedule to figure out how a C-USA regular season game between losing teams impacted the SEC elite. Stuff us humans don’t really care about. That’s how Alabama and LSU played each other again in the title game in 2011. Humans do care about conference championships. Humans do care about having one more win than another team. The past month we were waiting for Baylor’s victory over TCU to mean something as the committee continued to put TCU ahead of Baylor. Baylor’s weaker strength of schedule, especially in non-conference play was the reason given. But on Sunday afternoon, strength of schedule didn’t mean squat. Alabama, Oregon, Florida State and Ohio State all won an extra 13th game that Baylor and TCU didn’t even play. The result was Texas Christian and Baylor splitting the Big 12 title as Co-Champions. The problem though is how do you let one Co-Champion into the playoff without the other? Instead the committee just doled out bids to the teams that truly won its conference in the order that its conference is perceived as. SEC is first (Alabama), PAC-12 second (Oregon), ACC third (Florida State) and Big Ten fourth (Ohio State). If the committee truly valued strength of schedule then Ohio State would have been out as its home loss to Virginia Tech was worse than TCU’s defeat at Baylor and Baylor’s defeat at West Virginia. If TCU and Baylor played each other again this past Saturday it’s hard to see the winner of that game missing the playoff. But they didn’t play each other again, and the conference that was all about “One True Champion” is stuck with two champions on the outside looking in. This doesn’t mean that a Big 12 team can’t make the playoff. Just means it is a little bit tougher. TCU or Baylor would have had to go undefeated like Florida State to secure a spot. For a one loss team from this league to get into the playoff a championship game will go a long way to keep pace with the other leagues. Either apply for a waiver from the NCAA to get a title game with just 10 teams, or steal two more from another league. Seriously, what does Boise State have to do and how many Big 12 teams does North Dakota State have to beat? While TCU is wondering what else it has to do get a title chance, nearby SMU is happy to say it won a game. The winless Mustangs traveled to a UConn team that gave up football season for basketball weeks ago. The result was SMU overcoming a 20-6 halftime deficit to score three unanswered touchdowns for a 27-20 win. It was just the third time this season SMU scored over 13 points. You have to start somewhere I suppose. The game was really a three-hour billboard for how the American Athletic Conference is a mess of teams who don’t fit. Memphis, Cincinnati, and Central Florida all share the conference title. Begging the question, when you share a league championship with two other teams did anyone really win it? I predicted Jacksonville State would win the FCS championship before the playoffs started and whoops. The Gamecocks let me down big time losing to Sam Houston State 37-26 in the second round at home. 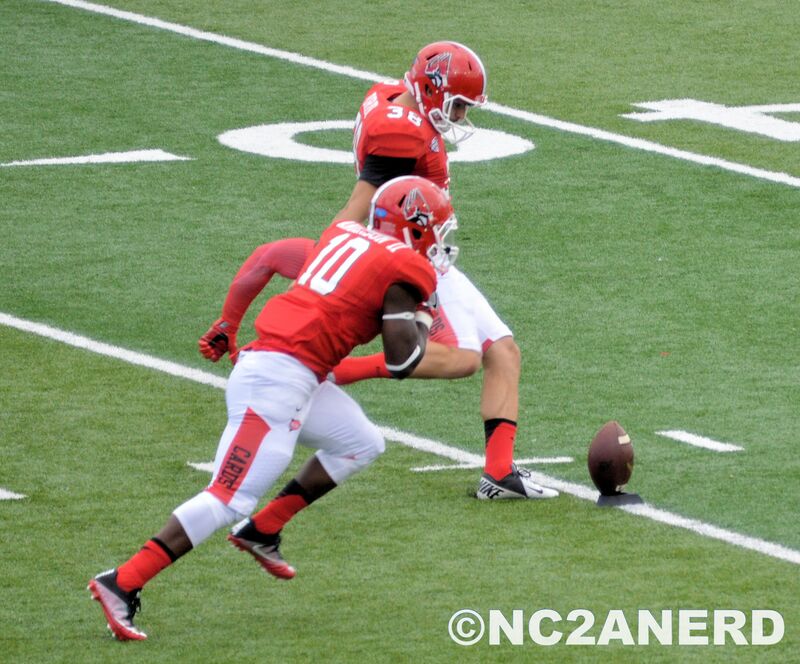 It was the first loss Jacksonville State has had to a FCS team all year. Give credit to the Bearkats for forcing two interceptions and keeping Jacksonville State scoreless in the second half. I wrote off Sam Houston State after it was blown out by a division II team at home back in September but have gone 9-1 since then. Jacksonville State’s defeat reflects badly on the Ohio Valley Conference as the league went 0-2 in the FCS playoffs. The first two rounds of women’s volleyball tournament were completed this week and 15 of the top 16 seeds have made it to the Sweet Sixteen. Only Kansas, the 16 seed, failed to make it out of the weekend. The last underdog team left is Oregon State and it’s hard to call a PAC-12 team Cinderella. The good news is that the best teams from the regular season are going to fight it out the next two weeks. The bad news is that my bracket looks pretty stupid for all the upsets I was hoping for. In an ACC battle for the Women’s Soccer Cup, congratulations to Florida State on its 1-0 win over Virginia. It was the first national championship in women’s soccer for Florida State and probably couldn’t have come at a better time given all the allegations the school has had to deal with the past year. If you think this is not a big deal at a football school like Florida State then check out this scene.